On October 16, 1993, Alerte Belance was abducted from her home and taken to Titanyen, a small seaside village used by Haiti’s rulers as a mass grave for political opponents. There she received machete chops to her face, neck and extremities. Despite her grave injuries, Belance was able to save herself by dragging her mutilated body onto the street and asking for help. Belance’s survival was extraordinary, but not all were so lucky. On January 18, 1994, Wilner Elie, a member of the Papaye Peasant Movement, was knifed to death by a group of masked men in his own home. His twelve children were handcuffed by the assailants and forced to watch helplessly as their father was brutally murdered. Elie and Belance’s tragic stories were not anomalies. Not long ago in Port-au-Prince, decapitated bodies littered the streets, warnings to would-be dissidents. Violent men sexually abused young women seemingly for sport. People were ambushed in their homes and shot to death for attempting to escape. Thousands of Haitians fled in shoddy boats through treacherous waters to the United States, only to be sent back despite outcries from human rights groups. Though it reads like a horror script or dystopian novel, this is not fiction. This was reality for millions of Haitians living under military rule. And now, as the Haitian government moves to rebuild its once-banished army, some Haitians are wondering whether a sequel is in the works. Haiti has a lengthy history of military and state-sanctioned violence. Shortly after coming to power in 1957, the infamous dictator Francois “Papa Doc” Duvalier, feeling threatened by the regular armed forces, created a paramilitary force to protect himself. Nicknamed the Tonton Macoutes (Uncle Gunnysacks) after an old tale about a bogeyman who abducted unruly children and placed them in gunnysacks to be eaten at breakfast, these men carried out unimaginable murders and sent tremors of fear throughout the nation. Accountable to virtually no one, they continued their reign of terror after Papa Doc’s death and through the rule of his successor and son, Jean Claude “Baby Doc” Duvalier. After Baby Doc was forced to flee in 1986, theTonton Macoutes were officially disbanded, but other paramilitaries continued in their footsteps. Meanwhile, the military itself continued to interfere in Haiti’s politics. On September 29, 1991, Jean-Betrand Aristide, Haiti’s first democratically elected president, was ousted by a military coup just eight months into his presidency. The coup, led by Lieutenant General Raoul Cedras, plunged the nation into a particularly violent and turbulent period. For three years the Haitian military and its paramilitary arm, the Front for the Advancement and Progress of Haiti, ran an exceptionally brutal regime, kidnapping, torturing and murdering supporters of the ousted Aristide. By 1994 the death toll had reached an estimated 5,000. Following an intervention by the United States, Aristide was restored to power in late 1994 on condition that he implement economic reforms favored by Washington. He dismantled the military the following year. The disbandment of the military did not cure Haiti of all its ills, but the dissolution was followed by two successful transitions of presidential power, in 1996 and 2000. In 2004, however, a paramilitary force consisting of former soldiers with help from United States, France and Canada organized a second successful coup against Aristide, who had been elected to a second term in 2000 after serving out his first in 1996. Although another successful transition between presidents began in 2010, the 2004 coup showed that even after their official disbandment, former soldiers were still able to influence political outcomes in Haiti. 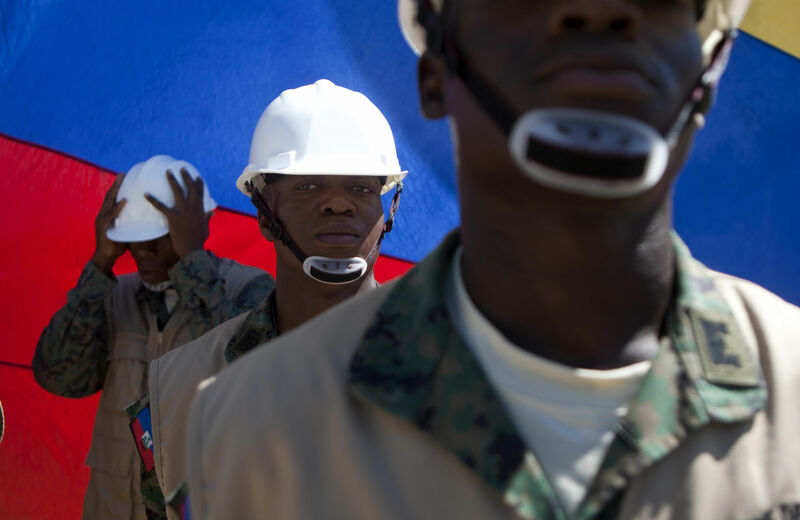 And now, after two decades in the shadows, the military is back: Haitian President Michel Martelly has followed through on a campaign promise to reconstitute the Haitian military. The new force launched its first operations this February. Martelly’s personal history provides some clues about his sympathies. Before he began his political career, Michel Martelly was a provocative konpa singer who went by the name Sweet Micky. During the Duvalier era, he ran a nightclub named Garage that was frequented by military officials and other members of Haiti’s tiny elite. Around this time Martelly befriended Lieutenant Colonel Michel Francois, the man who would later become chief of the secret police under Raoul Cedras. Martelly remained a “favorite” of the thugs who worked for the Duvalier regime and, after its collapse, would even accompany the death squads organized by Francois to murder Aristide supporters. While death squads hunted dissidents by night, Martelly taunted them by day. Lavalas, the massive pro-democracy movement launched by Aristide after Baby Doc was ousted, quickly became the target of Martelly’s biting lyrics. Throughout Aristide’s presidency, Martelly remained an outspoken critic of the president and his supporters, eventually emerging as a politician in his own right. After a hotly contested and controversial election in 2011, Martelly was elected president of Haiti. Later that year, an anonymous Haitian official leaked a document to the Associated Press outlining a plan for the revival of the Haitian military. The document cited several reasons why Haiti supposedly needs to spend $95 million building up a new military force: to provide opportunities for young people, to rebuild Haiti’s infrastructure, to patrol its border with the Dominican Republic and—perhaps most ominous—to “keep order” during times of chaos. Although Haiti is well within its rights to establish an army, the purpose of a military is not to provide internal security, but to combat external threats. A Haitian official claims that it’s embarrassing to have the United Nations providing security in Haiti. But although its mission has been marred by scandal, the UN is training a national police force to provide security and keep order once the peacekeepers finally leave. It’s unclear why a military would be preferable in this regard to a civilian security force. And it’s similarly unclear why Martelly thinks he needs a military to create jobs or invest in infrastructure. Haiti is in desperate need of construction workers—the country's infrastructure was already in a precarious position even before the 2010 earthquake leveled buildings and destroyed homes. If Martelly truly wanted to provide opportunities for young people, he could initiate a program that would train men and women in construction and create jobs for the multitudes of unemployed Haitians. Instead, the new military will supposedly be rebuilding the country while millions of Haitians continue to languish in poverty. In a country with a sparse amount of cash and a government unable to provide even the most basic necessities to its own population, it seems fiscally irresponsible and morally bankrupt to spend $95 million on rebuilding an army that has such an atrocious record of human rights abuses. The cholera outbreak, food insecurity and the 500,000 squatters lacking permanent homes are just a few of the litany of problems facing Haiti today. The lack of a military force is not high on that list of priorities. Although Haiti’s elite and powerful seem to support the new military, a poll conducted over five years found that fully 96 percent of Haitians oppose its recreation. Defying this widespread opposition and the pressing need for other development projects, Michel Martelly’s plan has finally come to fruition. Despite assurances from officials that this military force will not have the means to imitate its predecessors, the horrors of the recent past still linger in the minds of many. Haiti is now in danger of reverting back to the days when standing on the wrong side of the ideological fence meant certain death.